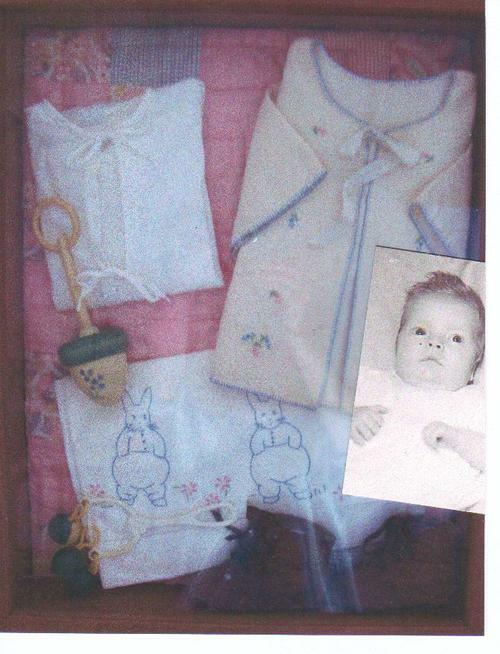 Here are some garments that Mother made for Baby Randy, adding fancy work to the little knit shirt and warming jacket and embroidered bunnies to a sheet for his crib. His well worn brown leather baby "walking shoes" can be seen at the bottom right corner. The background for this box is part of a quilt that my other grandmother made from family garment scraps, MANY years ago. The rattles are bakelite (collectors will know this is a highly sought after pre-plastic material). Ironically, they are green and gold - Baylor's colors. Randy has his Bachelor, Master, and Doctorate degress from Baylor and is now an associate vice president there. HMMMMM.